There was a time back in the not so distant past where the typical activity for dating teenagers on a Friday or Saturday night was to head down to the local Ice Cream Parlor or Malt Shop, sit down at the counter, share an Ice Cream Soda or a malted with a hamburger and fries, and then go out and see a B picture at the drive-in. As my grandparents and my parents used to tell me, there once were many such malt and ice cream soda shops, but few of these American originals survive today. One such place that seems to have resisted the destruction of these quaint landmarks of the 1950’s is Holsten’s, in Bloomfield. Opened in 1939, going there is literally like being sent back in a time machine to observe the social habits of pre-WWII and 1950’s American youth. The menu of ice cream treats and food items it serves are totally retro. This is not by design like one of the newer established 50’s chains like Johnny Rockets or Cheeburger Cheeburger, but because it has ALWAYS been that way — it is the Real Deal in every respect. The prices are also remarkably cheap, and while there only are about a dozen or so varieties of ice cream, all of them are made in-house and are very fresh. 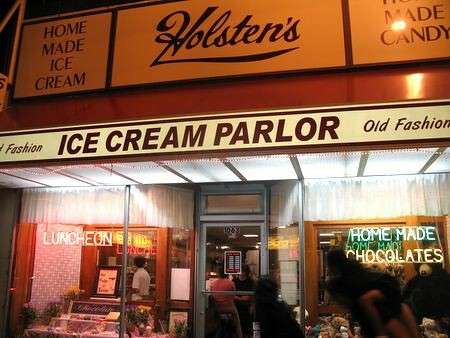 You don’t need to be the Jersey mob boss to appreciate the old-time ice cream at Holsten’s. Click on the “Read the rest of this entry” link below for more. 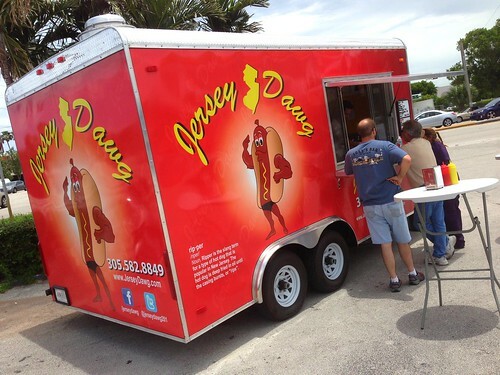 Jersey Dawg Food Truck, parked in the Shell Station on the corner of Cypress Creek Road and Powerline in Ft. Lauderdale, FL. It was almost one year ago that Rachel and I packed up what remained of our belongings and set forth in a Volkswagen to South Florida. We got on the New Jersey Turnpike, and drove until it became I-95. A week later, we found ourselves in the Fort Lauderdale and Pompano Beach area. Which we now call home. I’ve made my choice and I’m very happy with it. The weather is fantastic, I have a lovely home. The food down here is great. I have no complaints. Well, maybe one or two. There are certain types of food items that are either difficult or impossible to find in South Florida. You either have to go to great lengths to get them, or they just plain do not exist. And there’s certain things I fully accepted I would never have again, unless I returned home. Like New Jersey-style hot dogs and sliders. I mean, you don’t even think such a thing would exist here, so you don’t go looking for it. Sure, we have some really good burger and dog places. We even have a food blogger down here that specializes in it. He’s practically a celeb. But these are substitutes and not full-blown replacements. 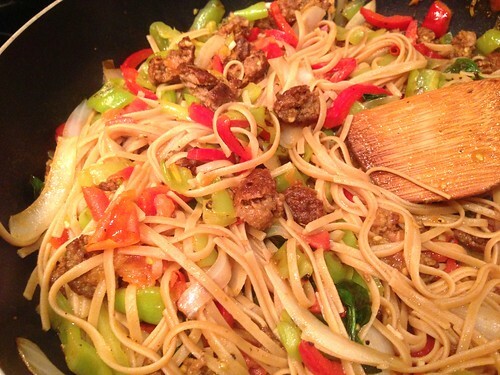 The only way you can replicate this kind of food is to have the exact ingredients and to prepare it exactly the same way. By someone who is intimately familiar with such things. So when I heard about Jersey Dawg, a new food truck that recently started doing Jersey-style hot dogs and sliders, I couldn’t wait. I hadn’t had either one in a year. Yes, fairy tales can come true. It can happen to you. Click on the “Read the rest of this entry” link below for more. Nothing gets my glands going like a good piece of meat! Marbleized, thick, and rare – it’s the stuff Pavlovian dreams are made of! Hot From The Kettle has been inside many kitchens, but few have left me in an absolute state of salivation like Chef Bill Zucosky at the Strip House. The Strip House is located in the award-winning Westminster Hotel in Livingston. 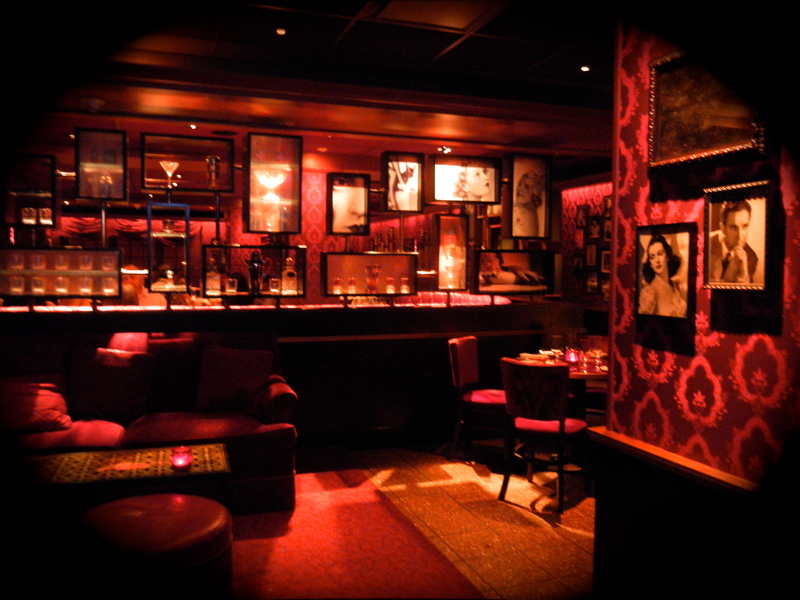 Decked out in red, black and velour, the Strip House might be the setting for scandalous affair, but it is always the place for a phenomenally satisfying meal and excellent cocktails. Chef Bill taught me how to cut the Strip House’s signature strip steak. Check out the video! From taco’s to Thai food, New Jersey food trucks are establishing a loyal and well-fed following. Hot From The Kettle® caught up with the Hunger Construction crew while their big red truck was parked near Mountainside Hospital. Owner, Aaron Rosenzweig, along with fellow potato heads, Shegan Rubin and Mav Bell, stuffed our spuds with chunky pastrami, hotdogs, cheese sauerkraut and more! If you’re a first timer, be advised, there are no forks to be found on the Hunger Construction truck. The method for attacking these giant spuds is most definitely, head down and go! Just how big are the spuds? Big, I tell you! Aaron purchases fifty pound bags of potatoes with the lowest count available from Restaurant Depot. Priced from $5 – $8 dollars, one stuffed potato is certainly enough to satisfy the most voracious eater. If you want to know everything about Hunger Construction, check out John Lee’s article from last month. Remember to follow Hunger Construction on Twitter at @hungerconstruct. Want to get on board the food truck! Watch the video below and visit the gallery for more pics from Hunger Construction! It’s the setting for a scandalous affair – dim lighting, crimson banquets, red velour sofas, and black and white photos of sultry stars. The Strip House, in the Westminster Hotel, smacks of refined bordello chic, and tastes as decadent as its décor implies. The menu at The Strip House boasts the usual steak house offerings, Iceberg salad, oysters, potatoes prepared a variety of ways, crispy onions, and steaks with bones big enough to take home to the dog! In the era of New American cuisine, a steak house runs the risk of becoming staid and dare I say, boring. 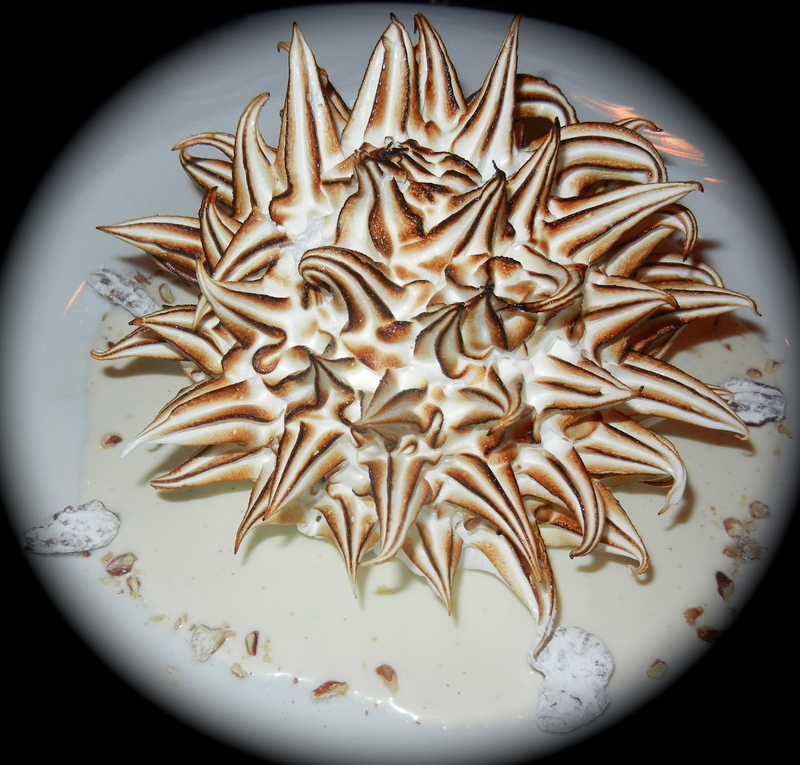 But under the direction of Executive Chef, Bill Zucosky, flawless execution and dedication to highest level of quality and service, has distinguished the Strip House from the steak house herd. Read all about the cocktails, the bone-in filet mignon and 24-layer chocolate cake on Hot From The Kettle. For those who don’t know, take heed: Ryan DePersio’s Bar Cara makes great pizza! The dough at Bar Cara undergoes a 24-hour cold ferment – like any great pizza dough should – and has a nice flavor profile that is noticeable and a light lift. 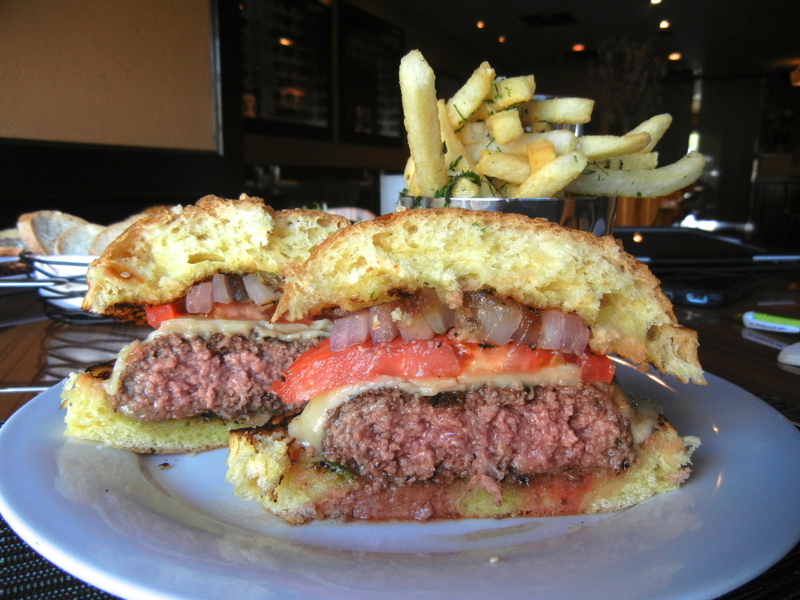 Then, there’s the Burger Americano priced at a very reasonable $10. Much has been said about burgers in New Jersey, and I have my own personal favorite, but Ryan’s ranks right up there with the best. Bar Cara uses a special blend of beef, brisket, short rib, and sirloin. And can we say, toothsome? Read more about the Bar Cara lunch, including charred octopus with crisp sunchoke, and the best-ever pistachio ice cream, on Hot From The Kettle. 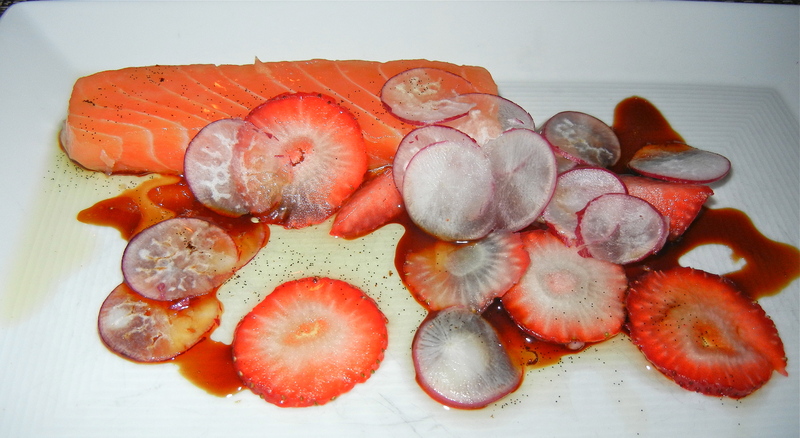 Next, Blu, a small, darkly lit, BYO in Montclair is the perfect place to indulge a sinfully delicious meal. Chef and owner, Zod Arifai, never appears in the dining room, but works wizardry from the kitchen, weaving textures and tastes into an all-but-irresistible spell. When you are in the restaurant of a renown chef, like Zod Arifai, it’s best to let him have his way with you- opt for the chef’s tasting menu! Read all about the nine-course degustation on Hot From The Kettle. You are currently browsing the archives for the New Jersey category.